While many people have floated the Middle Fork, few take advantage of the beautiful trail that runs along most of its course. These trips offer you a chance to hike some 48 miles over six days in the middle of the biggest wilderness area in the contiguous United States. Our supply raft carries all the camping gear and your personal belongings, so all you carry is a small daypack. You hike at your own pace, marvel at the Idaho river scenery, take photographs and meet us at camp each night where your tent and gear will be waiting for you. An expert guide accompanies you on the Salmon River hike, sets up your tent and prepares your meals. All you need to do is hike the moderate trails, relax, and take in the sights! The cooler months in June and September have been our guests favorite for hiking the Salmon. Please contact us: info@rowadventures.com | 800-451-6034 to learn more! 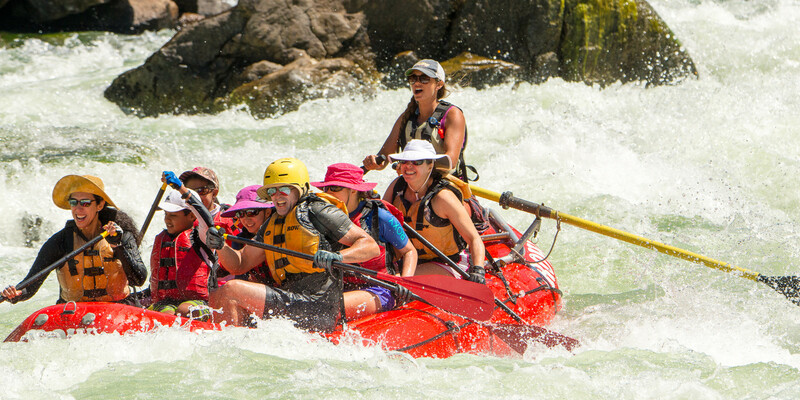 The Middle Fork of the Salmon River trip is one of the most popular rafting trips on the planet. We've desinged the perfect walk so you can have a chance to hike some 48 miles over six days in the middle of the biggest wilderness area in the contiguous United States. The Middle Fork Canyon is a place of superlative beauty. Your interpretive guide will point out prehistoric cave and rock paintings from the days of the Tukudeka, or Sheepeater Indians. You will hike through granitic pine-studded mountains rising to a sky of magnificent dimension and often enjoy transparent views to a golden pebbled river bottom. There are several hot springs along our route and we’ll stop to enjoy them, perhaps even making camp at one. In this unspoiled land, we’re very likely to see big horn sheep, probably more than once as they use licks along the river. We’ll also see eagles, hawks, songbirds and waterfowl and if we’re lucky, we’ll have sightings of deer, elk, mountain goats, mink and river otter. This trip offers luxury camping and fine dining. Around 4:00pm we arrive at camp. The cargo boat has gone ahead of the walkers and has the kitchen set up as well as the spacious 2-person tents that ROW provides. All you have to do is carry your personal gear to the tent of your choice and roll out your thick sleeping pad and sleeping bag. This leaves plenty of time to relax, climb a mountain, read a book, take a dip, watch for birds, throw out a fishing line or soak in the rays of the sun. On the fifth day of our adventure, we enter Impassable Canyon, a narrow, granite-walled canyon of spectacular dimension. When the trail was being built by the CCC in the 1930’s they got through just eight miles before they gave up to the vertical walls of granite and turned the trail west to head up Big Creek. On our last day you enjoy a long day of whitewater fun on the river. For about 20 miles we are in a narrow granite-walled gorge of spectacular dimension, the constriction of the river, coupled with the large volume of water makes for an exciting day. Then a 2-hour bus ride will put everyone in the town of Salmon at about 5 pm. That evening enjoy a farewell dinner hosted by ROW. We make hotel reservations at the Stagecoach Inn that evening. Therefore, you can make your return travel plans the next day. Enjoy our gourmet hors d’ oeuvres and meals. dinner. The quality of our food reflects the quality of the wilderness environment in the Middle Fork canyon. We hand-select the freshest fruits and vegetables we can find and pack them carefully in huge ice-coolers. Likewise, these coolers carry fresh dairy products and meats. From these ingredients we prepare bountiful, healthy meals. Sustainably harvested wild Alaskan Salmon served with a fresh garden salad; Prime Rib combined with a fresh Chilean salad and Idaho mashed potatoes or made-on-the-river lasagna is a few possible entrees. Big salads of vegetables and fruit add color and variety to every meal. Desserts are made each evening in our Dutch ovens and range from authentic cobbler and pineapple upside-down cake. We serve juice each morning and moderate amounts of bottled wine with dinner. We also provide two beers and two sodas or juices per person per day. There's always plenty of cold water, lemonade mix, tea, coffee and cocoa. You're welcome to bring your own beverages or alcohol as well. We always have plenty of ice to keep your drinks cold. Why go with ROW on the Middle Fork? Our itinerary is designed to visit many different points of interest, taking advantage of rock art sites, pioneer homesteads, and natural wonders in the river canyon. You may only visit the Middle Fork once in your life and we want to make sure you see the best that it has to offer. Your trip is enriched by knowledgeable guides who share the canyon's cultural and natural history. No other company on the Middle Fork of the Salmon River trains guides like we do, and most of our guides are also Certified Interpretive Guides through the National Association for Interpretation. Trip logistics are designed to maximize time on the river. The quality of our food reflects the quality of the wilderness environment in the Middle Fork canyon. We hand-select the freshest fruits and vegetables we can find and pack them carefully in huge ice-coolers. Likewise, these coolers carry fresh dairy products and meats. From these ingredients we prepare bountiful, healthy meals. Sustainably harvested wild Alaskan Salmon served with a fresh garden salad; Prime Rib combined with a fresh Chilean salad and Idaho mashed potatoes or made-on-the-river lasagna are a few possible entrees. Big salads of vegetables and fruit add color and variety to every meal. Desserts are made each evening in our Dutch ovens and range from authentic cobbler and pineapple upside-down cake. We serve juice each morning and moderate amounts of bottled wine with dinner. We also provide two beers and two sodas or juices per person per day. There's always plenty of cold water, lemonade mix, tea, coffee and cocoa. You're welcome to bring your own beverages or alcohol as well. We always have plenty of ice to keep your drinks cold. How do I get to Stanley? Air taxi transport to/from Boise is available. Or drive to Stanley and shuttle your car to the takeout point in Salmon. If low or high water requires a flight into Indian Creek, there is an extra charge. Call 1-800-451-0841 for pricing.